As Original vampire-werewolf hybrid Klaus Mikaelson returned to the vibrant, supernaturally charged city of New Orleans, he was stunned to learn — along with siblings Elijah and Rebekah — that Hayley, a werewolf, was pregnant with his child, and his vampire protégé, Marcel, whom the Original siblings had thought long dead, was ruling the French Quarter. Soon a bloody war escalated between vampires and witches, the stakes raised by powerful teenage witch Davina, and by Klaus’s bond with Cami, a student with a painful past, and a ruthless pack of wolves seized the opportunity to stage a violent coup. Original The Originals: The Complete Second Season DVD released by WARNER Bros comes in 5 disk DVD pack. DVD having 3 Subtitle. Duration of the Tvserial in DVD is 900 Min [approx.] While processing the order, we bubble wrap the DVD in its original packing and send it in sealed plastic or carton pack. 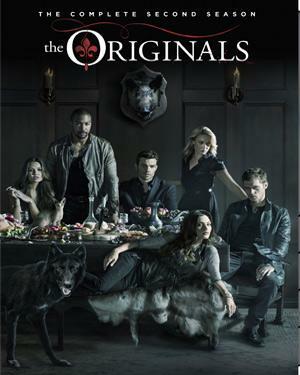 We don't offer download of the Tvserial The Originals: The Complete Second Season, nor we send free poster of the Tvserial along with its DVD order. We also don't offer free wallpaper or song download of the Tvserial. Poster and other accessories of the Tvserial can be purchased separately. Buy English DVD The Originals: The Complete Second Season and watch them at the comfort Of your own home. Online shopping The Originals: The Complete Second Season DVD, Buy The Originals: The Complete Second Season DVD, purchase original English DVD of The Originals: The Complete Second Season. Online store to buy The Originals: The Complete Second Season DVD	, online DVD store india, buy English DVD, watch English movie The Originals: The Complete Second Season videos online. We don't offer DVD renting for English movies online, Buy Original The Originals: The Complete Second Season DVD @ discounted and cheapest price online in India.